Just noticed that the link to the main site of Kanzenshuu is linking to an online shopping website, with the main focus being women's handbags. Click on "Back to Main Website" on the top of the forum to see what I mean. This is quite an interesting state of affairs. Last edited by Shiyonasan on Sun Mar 01, 2015 6:03 pm, edited 4 times in total. hleV wrote: It links to http://www.kanzenshuu.com/index.php for me. Can you hover the link and copy its location to show us what do you mean? Not really sure what's going on for you (or if this has already been resolved), but mine also links to the main page just fine. Hmm...that is strange. It's still linking to that site for me. As I edited into the first post, the guys at Kanzenshuu are aware of this, so it seems to be an issue for more people than just me. EDIT: The link to the main site is now fixed for me. It's happening the same to me with the movie guide page. EDIT: The newbie guide also links to the shopping site. It's hit-and-miss for me when I try getting on the main page, both on mobile and on my laptop. Some 'Tidbits' pages are also affected. Don't know if it's random or not. Well it looks like I have some investigating to do. It works fine for me if I access the pages from the main site, but whenever I try to access a page by googling it, it links that website as well. I never had a problem with the site or forum. I guess it's just you or something. Just went and replicated the problem. Googling "Kanzenshuu" and clicking on the link redirects me to the burberry site. Just checked and the same thing is happening for me. All links to the main website redirect to that Burberry site. It also happens when I click on "Back to Main Website" at the top of the forum. Don't know if that relates to any of this, but I thought I'd point it out anyway. Just to add, on google when searching for Kanzenshuu it also says "This site might be hacked". Edit- Nevermind, that message seemed to have gone now, but it is still linking me to the shopping website. 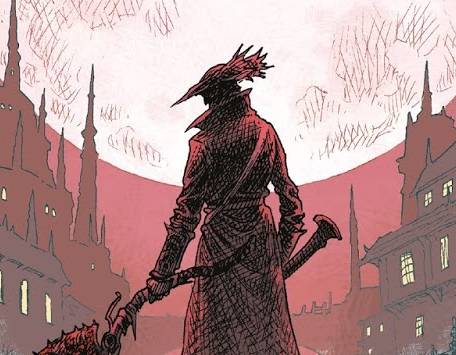 Just jumping in real quick to let everyone know that we are working on this. I'm aware of what's happening, but am still working out the root cause so I can stop it. I would still ask people report any new issues they come across. Thanks! Hujio wrote: Just jumping in real quick to let everyone know that we are working on this. I'm aware of what's happening, but am still working out the root cause so I can stop it. I would still ask people report any new issues they come across. Thanks! 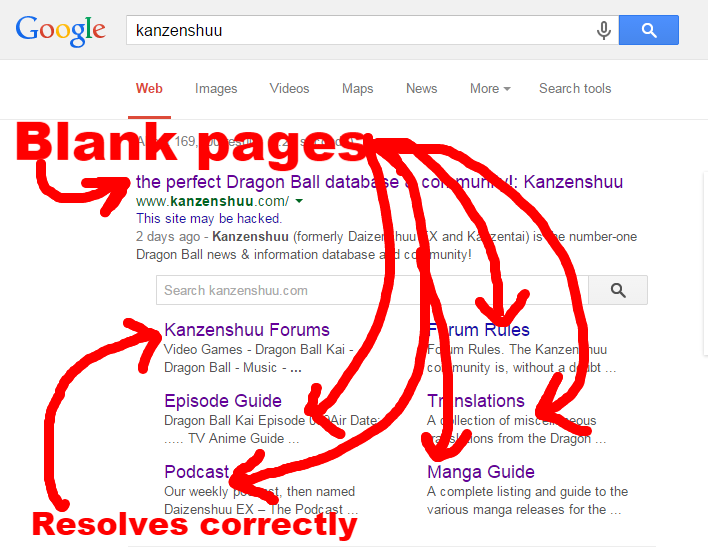 Now if I Google "Kanzenshuu" links to the main site resolve to blank page (literally nothing in page source), but going to kanzenshuu.com directly works fine. Sub result links also fail if they're part of the main site, but Google link to the forum works correctly. And Firebug doesn't show anything loading in there. Going directly to the page (typing it in the adress bar) works ok.
Alright, everything from our end should be fixed. However, it will probably take search engines a bit of time to catch up, which is why there are some blank pages showing up for people.